The Best Thanksgiving Pie Ever! INGREDIENTS: 3-4 pounds (weight before peeling) of Granny Smith and a second, less tart apple like Honey Crisp, Mutsu or Crispin; 3/4 cups + 1/2 cup light brown sugar; 3 oz of lean, natural bacon; 2-3 tablespoons unsalted, sweet creamery butter; 1 tablespoon unbleached, all natural, all purpose flour (Whole Foods 365 brand or King Arthur are great choices); 2 teaspoons good quality ground cinnamon; 1/8th teaspoon fresh ground ginger. 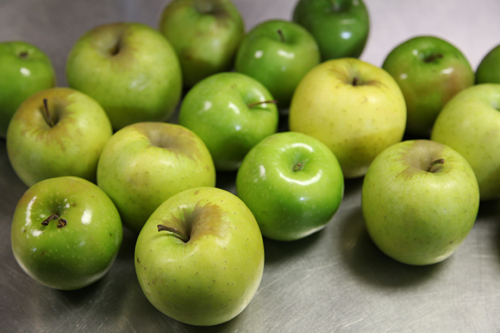 Maggie highly recommends that you use organic apples and split them 2-1, (2 granny smiths for every one Honey Crisp, Mutsu or Crispin apple) Slice these thinly the length of the apple. You'll also want to use a lot of apple. As Maggie shares, "This isn't one of those 'mostly liquid with a little fruit' pie." Cut bacon into small pieces and render on low temp until just browned. 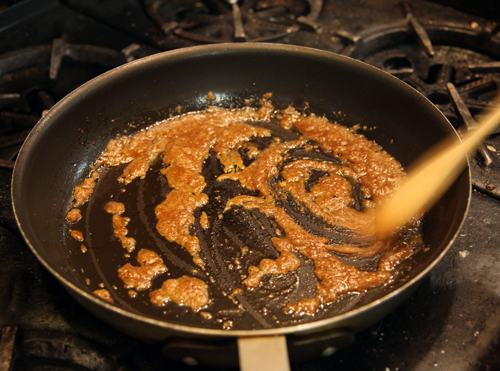 Remove bacon from pan but leave the rendered fat and add the butter, maintaining low temp, until butter is just melted. 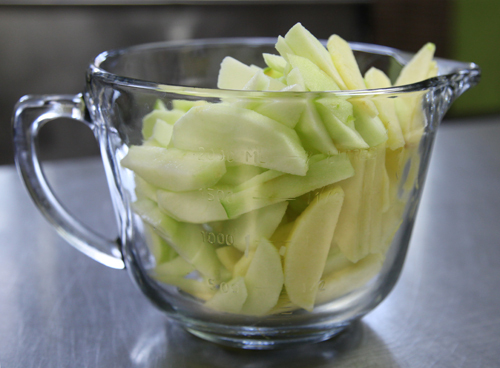 Add thinly sliced apples and turn temp to low-medium. Add cinnamon, ginger and 3/4 cup brown sugar, strirring frequently to mix and prevent apples from browning on the bottom of the pan. Use the same crust recipe as we used for Maggie's other incredible dessert- the Brandied Peach Pie. 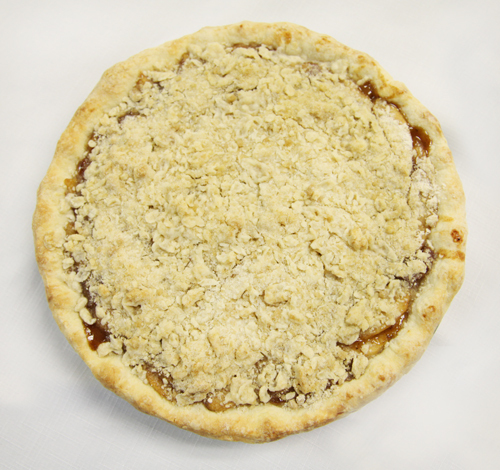 Instead of a pie top, use a streusel topping with 1/2 cup flour, 1/3 cup brown sugar, 2 tablespoons butter, 1/2 teaspoon of salt. Bake the pie for 30 minutes, then check in ten minute increments for done-ness. If you are using a glass plate, you can see if the bottom crust has started to brown.